Now that Spring has finally sprung in Minnesota, well sort of…(at least there’s no snow) it is time to consider Exterior Home Renovations to add curb appeal, increase the value and energy efficiency of your home. Bannochie Builders, Inc. has a team of Skilled Professionals who are highly qualified to enhance the exterior of your home with Windows, Siding, Roofing, Decks and Driveways. Whatever is standing in the way of you loving your Minneapolis, MN home, Bannochie Builders, Inc. can solve the problems and Exceed Your Expectations in Value, Service, Efficiency and Beauty. New, Energy Efficient Windows can add instant beauty and comfort to your home. Bannochie Builders, Inc. provides a variety of window choices that can enhance your home’s aesthetics and Lower the Heating and Cooling Costs. You can choose from different sizes, shapes and styles to match your home’s architectural identity. Go ahead and make a bold choice in Maintenance Free Vinyl Siding. There are so many different color choices and profiles to choose from. Each vinyl siding product offered by Bannochie Builders, Inc. is of High Quality and built for Long-Lasting Results. Your home will look beautiful and you can also enjoy the benefit of Improved Energy Efficiency. A New, Quality Roof provides your Minneapolis, MN home with the highest level of protection from storms, cold, ice, rain, wind and sun. Proper Installation and Quality Materials are essential for providing protection from Minnesota weather year after year. The Skilled Professionals at Bannochie Builders, Inc. are very detail oriented and offer a variety of roofing materials and colors that are sure to improve the look and function of your home. Now is a great time to get outside and enjoy a New Custom Built Deck from Bannochie Builders, Inc. As Licensed Contractors, we can provide our clients with a beautiful new deck that is custom designed for their home. You can personalize your outdoor living space with maintenance free decking, railings and decorative details. Just think of the hours you can spend enjoying the outdoors and entertaining friends. The harsh climate in Minnesota can really damage a Concrete or Asphalt Driveway. Bannochie Builders, Inc. can help you with cost effective repairs to fit within your budget. Our team is experienced and skilled with paving options that can fix your damaged driveway, sidewalks and walkways. 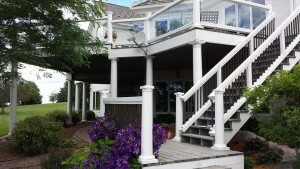 Contact Bannochie Builders, Inc. for Exterior Renovation Solutions for your Minneapolis, MN home. Our team of Skilled Professionals provides all of the necessary elements to Enhance the Curb Appeal and Energy Efficiency of your home. Ask Us about options for Energy Efficient Windows, Siding and Roofing as well as Custom Designed Decks. See for yourself why our services Exceed Expectations in Value, Efficiency, Quality and Beauty. This entry was posted	on Friday, April 10th, 2015 at 3:21 pm	and is filed under Exterior Home Remodeling MN. You can follow any responses to this entry through the RSS 2.0 feed. You can leave a response, or trackback from your own site.